Husky Injection Molding Systems hosted its European Beverage Packaging Conference, a major stop on its year-long World Tour, on September 12. 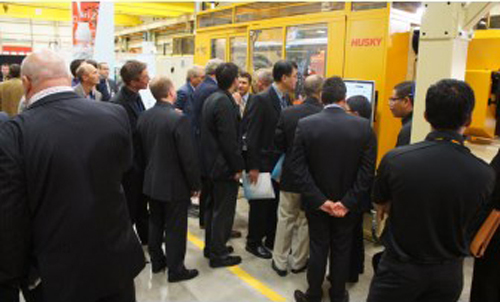 Held at its EMEA headquarters in Dudelange, Luxembourg, the event was attended by more than 90 business leaders from around the world and showcased Husky’s broad range of solutions for preform and closure manufacturing. Keynote speaker Jochen Hirdina, Vice President of Plastic Technology for Krones AG, delivered a presentation on economic blowing and filling bloc solutions for water, carbonated soft drink and sensitive products. Key presentations by Husky experts covered the topics of beverage closure injection equipment trends, developments in PET preform manufacturing and making the case to purchase new equipment. A highlight was an exclusive preview demonstration of Husky’s next generation HyPET High Performance Package (HPP) 5.0 system, which will be officially launching before the end of the year. The HyPET HPP 5.0 400 system produced a 22.26g preform for a 500mL aseptic juice application, running an 8.1s cycle time and using resin supplied by Indorama. Husky also demonstrated a HyPET system with a new 96-cavity mold upgrade, which offers a more than 30% increase in production capacity, as well as a turnkey H-PET AE (All-Electric) system, which offers added value to customers entering into or expanding their presence in the beverage packaging market.